Blount’s disease is a rare, early childhood developmental disorder affecting less than 1% of the population in the United States. Although the exact cause is unknown, research suggests it’s occurrence is correlated to childhood obesity which continues to increase at alarming levels, low levels of Vitamin D and walking prematurely between eight to ten months of age. Traditionally in the past, management of this etiology consisted of locking the child’s knee joint of any motion with the hope of preventing further progression of the leg bowing. This method has shown that wear compliance was a primary issue due to altered gait/walking patterns by locking out the normal range of motion dynamics. Recent studies indicate that if an individual has the ability to control muscle function, then it’s biomechanically counterproductive to expect correction when limited to a closed system that does not allow the natural movement of muscles and joints. Current technological advances toward designing more dynamic knee joint structures that allow for a more natural open system has given our patients a better chance for correction and in some cases prolong or completely eliminate having to undergo surgery. Proven conventional methods such as the devices we manufacture here at Anatomical Concepts, Inc. should always be advocated first as the benefit-cost ratio and low risk factors are better suited for children and their families. The V-VAS (Varum Valgum Adjustable Stress) knee joint design is a unique alternative to only several other traditional designs currently on the market. The success of the joints in order to provide the corrective forces leading to the resolution of the skeletal malalignment is achieved through the joints ability to isolate measured tibial, femoral and or tibio-femoral alignment in 2 and 4 degree increments respectively, either independent or dependent of each other as viewed in the coronal plane. 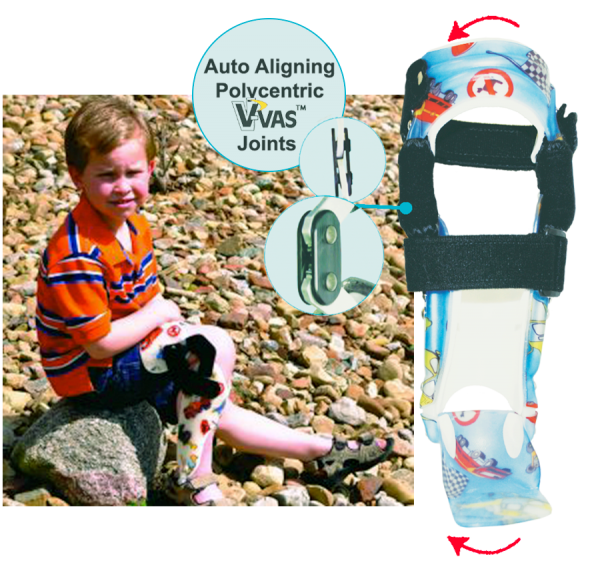 The resulting effect of the V-Vas joint systems dynamic adjustability capabilities provides a bending moment at the knee. This bending moment is what maintains the four-point correction not only in full extension as do all other previous designs, but throughout the full range of knee motion that is unique to the V-Vas joint system. Always take impressions in a non-weight bearing position with no need to correct the knee deformity. Specify on your orthometry form whether knee and/or foot/ankle positioning is fixed or flexible. For non-compliant patients, take cast in two parts addressing the proximal thigh/knee section first then finish with foot/ankle. Seal cast impression with tape or staple. Provide hash marks on cast impression along with appropriate delineations of all boney landmarks and/or preferred trimlines. Fully complete Anatomical Concepts Orthometry form for accurate care of your patient’s case. The specific design features of the V-Vas include 1/8” polypropylene posterior opening thigh and tibial cuffs to simplify donning and doffing process. Extension of the plastic proximally on the medial side recommended for genu varum (bow leg) or laterally for genu Valgum (knock knee) as this offers increased leverage for rotational stability within the transverse plane and provides additional comfort by increasing the surface area by offsetting the corrective forces. Closed cell foam lining encompassing the inside of the thigh and tibial cuffs can be removed to accommodate circumferential growth. Availability of height growth for the child is achieved by adjusting the length of the medial and lateral femoral and tibial uprights in ¼” increments. These are very cost-effective features that extends the devices’ life without having to fabricate multiple new ones as the child continues to grow. It is recommended to ensure that the proximal forces are maximized properly that the use of a free motion medial and lateral ankle joint is utilized as opposed to other variations on the market that uses only one ankle joint.